What type of cupcake am I? Through a friend that works at WPIX news, I found out about a cool website called “My Cupcake Day” that was started by the co-founder of Magnolia Bakery, and current owner of Buttercup Bake Shop. While checking out the website, I found a “What type of cupcake are you” quiz. Naturally I took it. 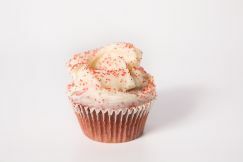 Sophisticated, chic and stylish, the red velvet cupcake best suits your personality. On top of the sweetly seductive, yet traditional taste of the vanilla cupcake, there is a subtle hint of cocoa that’s sure to please the chocolate lover in you, all immersed in a deep shade of red for the visually-inclined gourmands, and balanced by delicious cream cheese frosting. You enjoy the best things in life, and you are in tune with the hottest trends, most exciting events and entertainment. You embody the outgoing, fun-loving nature of Vanilla types, and share the determined, goal-oriented nature of Chocolate personalities, with an edgier, fashion-forward style.